Greenfield Creations were honoured to supply one of their “Garden” coffins for the filming of Hayley Croppers funeral on Coronation Street. On the 31st January estimated 20 million viewers watched as Hayley was given a beautiful funeral that reflected all aspects of her life. When asked about this wonderful media opportunity William reflects that he had to submit three designs and wait some months before knowing which programme it was for and why…and then keep a lid on it, so to speak. Though pleased to be approached, he wasn’t surprised the Coronation Street Design team chose this type of coffin. It’s a reflection of the increasing amounts of customer awareness, involvement and demand for alternative funerals and burials. People really can choose a coffin to reflect exactly what they wish for, be it for themselves or a loved one. As William points out, ‘People are as different in death as they are in life and a personalised coffin can pay such a fitting tribute to the one who has passed.’ Just as Hayley’s did! 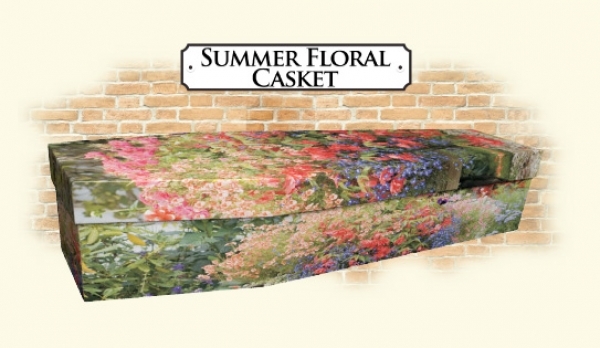 The “Garden” coffin was designed about 10 years ago by one of the company’s founders Jacky Hunneybel, and depicts a glorious English garden in full bloom. Jacky was inspired by all things bright and beautiful, and the coffin design was a result of her attention to authentic detail. Unfortunately, Jacky was also quite unexpectedly diagnosed with cancer, sadly losing her battle not long ago. William explains that Jacky would have been greatly moved to see this choice of coffin for Hayley and deeply touched by the storyline. It had always been a desire of Jacky’s that these inexpensive, eco-friendly, bespoke coffins be readily available to people, and with this major television event, more people will be able to see than she could have ever dreamt possible. Greenfield Creations have been manufacturing cardboard coffins since 1990.